Other one says,"We'll break his legs!" "choro yaar bechara akela hai aur hum teen. An elephant falls in luv with an ant. But ant’s parents are against their marriage. Ladke k daant bahar hai. baad hathi mar gaya . 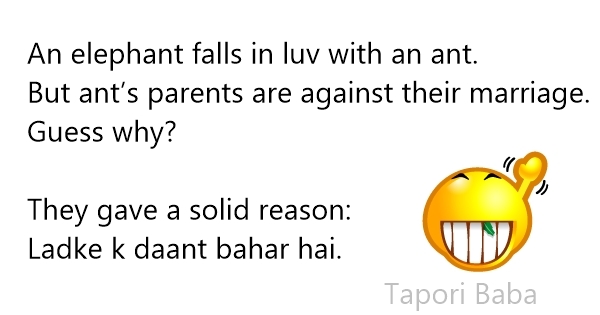 pyar aur zindgi bhar ki khudai. chitti ne kaha MAI TUMHARE BACHE KI MAA BAN NE WALI HUN. Ant : what's your age? ? ? ANT: But you look big!!!!! elephant : bUt u luk Young, ! Ant: POND$ AGE MIRACLE KA KAMAL HAI ! Its not allowed to have Inter”size” Marriages in our community. Please forget about me ! Raaste me usse haathi mila... haathi ne poocha... "hey chiti kaha jaa rahi ho". chiti ne bola"frock silwane jaa rahi hu." 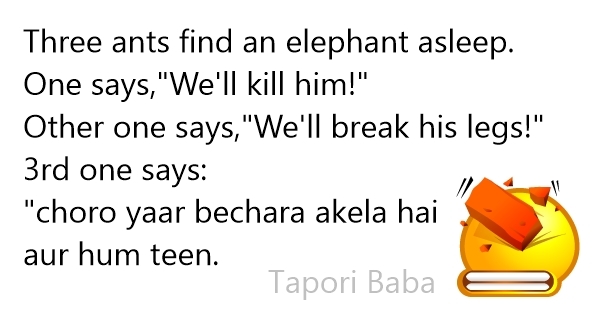 To haathi bola.. "Agar kapda bachee to mere liye pajama silwaa dena"
then an elephant came it asked him that not to eat the sugar and she stopped ............... and then shopkeeper demanded him that i was saying him from so many time but u said once he stopped how comes? Once Haathi and Cheenti were riding on their motor bikes, they were driving normally, following traffic rules, had their helmet and also all other things regarding traffic rules in place. There was Police Checkpost in the way.. The cop stopped both, inspected papers, license etc of cheenti (the Ant) and let her go then the COP took the license of Haathi(the elephant) he examined his license and then him, then again his license and then him. Though his license was authentic, still COP asked him to stay ..
because the cop suspected haathi as his photo did not match as he is too big to fit on a passport size photo. Ek baar haanthi aur cheeti mein zorr ki behas hui, bohot ladai hui ki unhone iss behas ko khatam karne ki liye panja ladayein, jo panja jeetega, usi ki baat sahi hogi..
Dono Punja ladane ki liye aamne saamne aa gaye .. fir bhi unki behas ka hall nahi hua..
Kyunki cheenthi aur haanthi k paas Panja hi nahi ladane ko toh panje se unki behas ka hal nahi ho saka. Ek hathi aeroplane me pilot chinti say headphone cheen leta hai. Chinti says! yeh kia ker rahe ho? A male Ant hops onto the back of a female Elephant, with a view to having his wicked way with her, the Elephant steps on a thorn and trumpets loudly the Ant says"am I hurting you? One asked why r u all rushing , where you need to go ? they replied hospital. The first one asked why ? they all replied , ELEPHANT HAD AN ACCIDENT , HE NEEDs BLOOD! cuz the ant don't wear swiming dress. Aik Chiti or Hathi me bahut gahri dosti thi. Hathi ne chiti se poocha: tum mere liye kiya kar sakti ho. Chiti: me apne khoon ka aik aik katra tumhare liye baha sakti hoo. Q. Where does an elephant carry its laptop? Ans: In its trunk of course! Chinti Auto Mein Beithi Or Ek Pair Bahar Rakha. Chiti or hathi bahut gahre dost hote hai, aik baar hanthi bimar ho jata hai. Chiti bhagi bhagi hospital jati hai to raste me uski friend milti hai or puchhti hai, itni tez kaha bagi ja rahi hai. Chini ne bola mera dost hanthi ka accedient ho gaya hai, khoon ki zarurat hai wahi dene ja rahi hu. 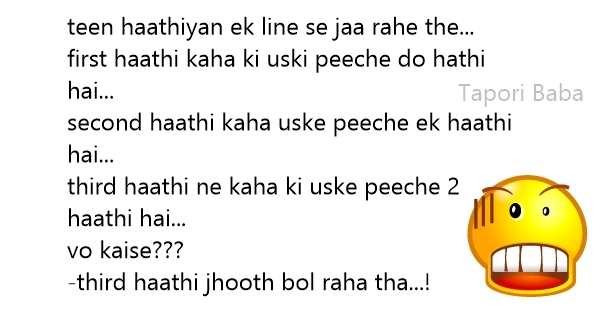 third haathi jhooth bol raha tha...! Dusre din hi HATHI mar gaya....! ka pyar diya, aur sari umar Kabar khodane ka kam diya"
Lekin chinti ko kuch bhi nahi hua...! 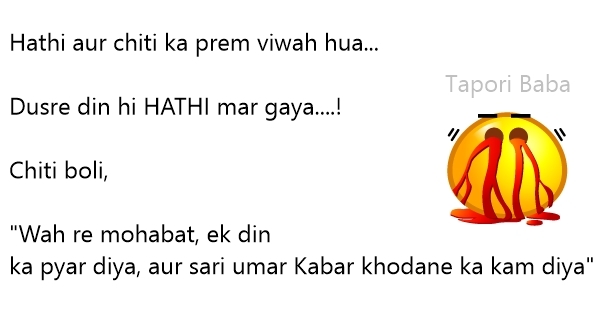 duba de saale ko …. !!!! Hathi aur Chiti safar par ja rahe the. Hathi ne samaan apne kandhe par uthaya tha. Kuch der chalne ke baad Hathi ke kandhe dard karne lage. Chiti: Kaha tha na maine ki samaan mujhe uthane do! Yahan meri koi sunta hi nahin!! Once an elephant went for a walk and accidentally walked over few ants. The ants felt very sad, and decided upon revenge. One day, the elephant was sleeping under a tree. The ants climbed the tree. While leaning over, one fell on the haathi. The others started screaming "kuchal daal. dabaa daal saale ko. 1 chiti hathi par beth k ja rahi thi. Raste me kaccha bridg aa gaya.